President Trump's ownership stake in a luxury hotel in Washington is a fixture of the conflict of interest concerns swirling around his administration. But recently released disclosure forms show his daughter Ivanka has a big stake in the same property -- one valued at $5 million to $25 million. That asset and other high-value business interests are raising new ethics considerations now that Ivanka Trump is taking an official position in the White House. As a federal employee, she is subject to rules that prohibit her from participating in matters in which she has a financial interest. Can she have a business meeting at the Trump International Hotel, a few blocks from the White House? Is she allowed to attend events there with foreign diplomats, and discuss matters of government with a hotel customer enriching her family? 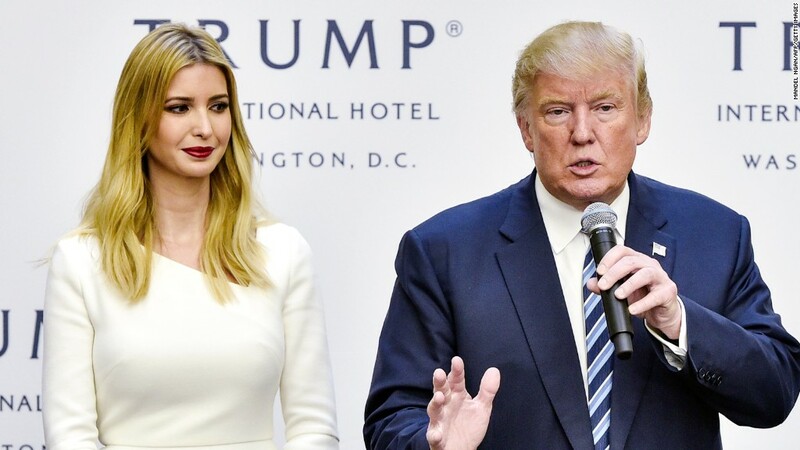 Norman Eisen, a Brookings Institution visiting fellow and former ethics lawyer for President Barack Obama, said the best course for Ivanka Trump is to steer clear of the hotel. "She's not allowed to do anything in her official capacity to promote that hotel," he said. "Even if she does so much as suggest to someone that they should have an event at the hotel, that would be off limits." Financial filings from Ivanka Trump's husband, senior White House adviser Jared Kushner, show she pulled in as much as $5 million in income from the hotel last year. Ivanka Trump, whose White House job was announced only last week, is expected to file her own forms within a month, but much of her finances are captured in her husband's disclosure forms. Ivanka Trump's plans to recuse herself from policy issues that conflict with her financial interests, or to sell assets that might present conflicts, are not clear. Her lawyer, Jamie Gorelick, told CNNMoney last month that Ivanka Trump would recuse herself from certain policy matters, like trade agreements specific enough to affect her line of clothing and accessories. Gorelick also said that her client had converted her stake in her father's company into fixed payments, adding a layer of separation from the financial performance of the Trump Organization. At the time, Ivanka Trump was joining her father's administration in an unofficial capacity, but said she would act as though ethics rules applied to her. Now that she is a formal employee, she is bound by them. Asked on Monday for further details, including whether she would sell her stake in the hotel, Gorelick's office deferred comment to the White House. The White House said only that Ivanka Trump and Kushner's holdings would require "some recusals" to be managed by White House ethics lawyers and the Office of Government Ethics, which works with executive branch employees to avoid conflicts. But it's not clear that the White House will ever make details about those recusals public. The White House did not respond to a question about whether the stake in the hotel was a concern. Eisen, the Obama ethics lawyer, said Ivanka Trump's potential conflicts would likely not be as troubling on their own. But he said the Trump administration's track record on ethics haven't inspired much confidence. "The system is a total mess," Eisen said. If the hotel "were the only dot we were connecting, the only puzzle piece, one could look the other way. But this comes in the context of her father's extraordinary constitutional ethics violations." Eisen is the board chairman of Citizens for Responsibility and Ethics in Washington, a legal watchdog group that has sued the president and claimed he is violating the Constitution by accepting payments from foreign governments through his business. The group also lodged a complaint last month with the White House against Christopher Liddell, a White House official it claims may have broken conflict-of-interest laws by going to meetings with corporate executives while he personally held stock in the companies. And in February, the Office of Government Ethics scolded top aide Kellyanne Conway for plugging Ivanka Trump's products in a TV interview.